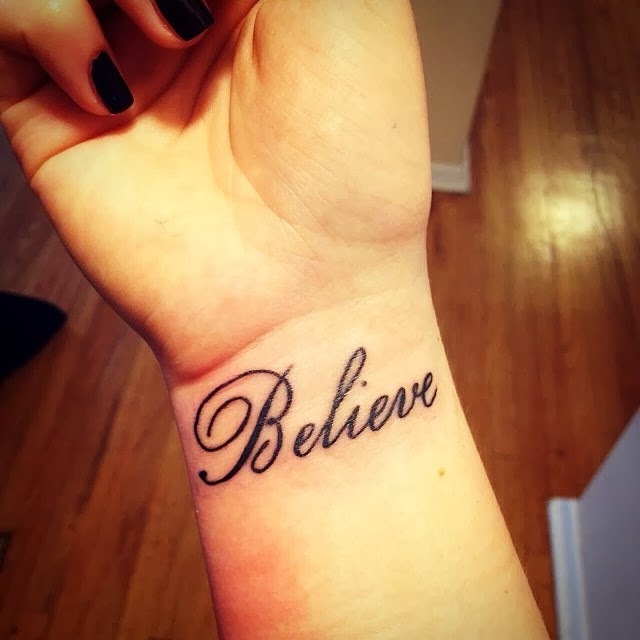 While selecting a tattoo with a wording, a person needs to pick up a phrase or a word that would be meaningful and carry some value for the user. 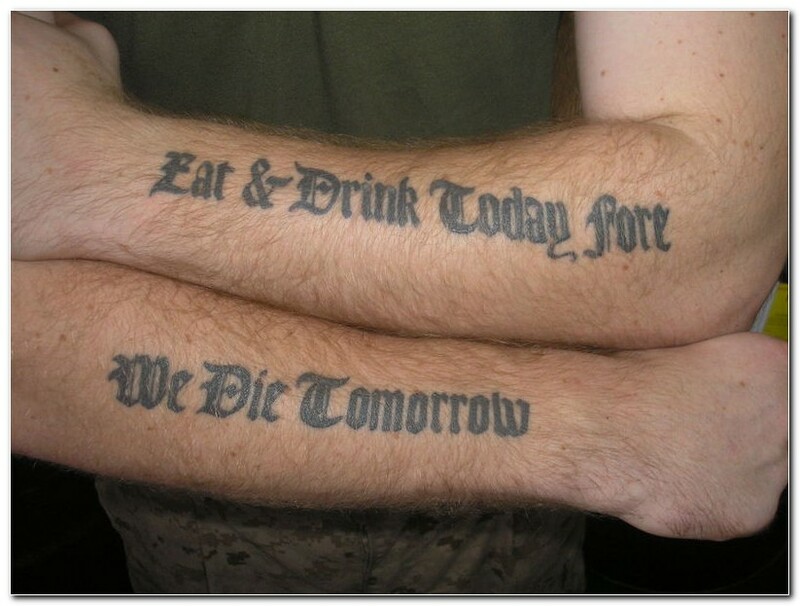 In this case we’ve got a tattoo with a word “life”. It shows us an importance and need to value life in all aspects and forms. This option is made in an elegant and stylish handwriting that would be mostly suitable for some lady rather than for a man. The males would prefer the text in some sharp edged font. 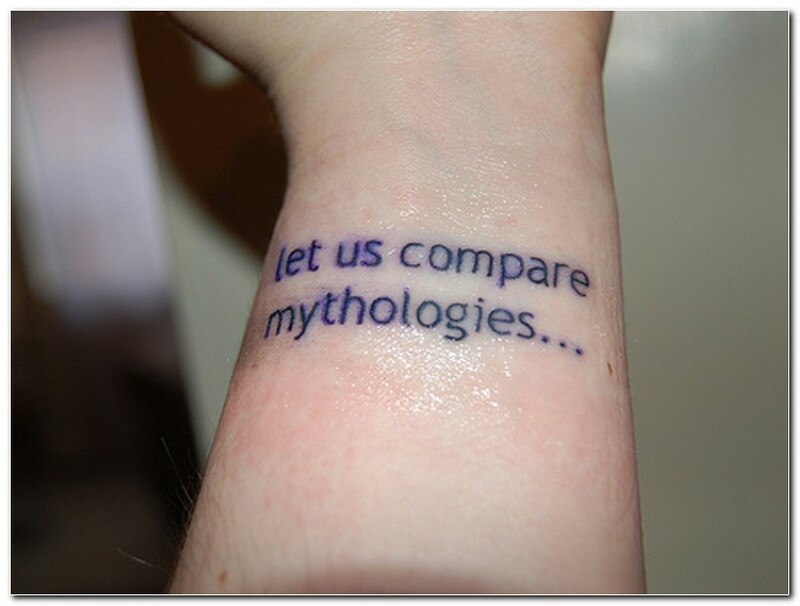 “Let Us Compare Mythologies” is the first collection of poems that was written by a popular Canadian writer Leonard Cohen. In his works he used to present the biblical and mythological images that were distributed through the words of some wise prophet. This is an awesome reminder that all the things have something in common and that all of the ideas and images derivate from a single common source. 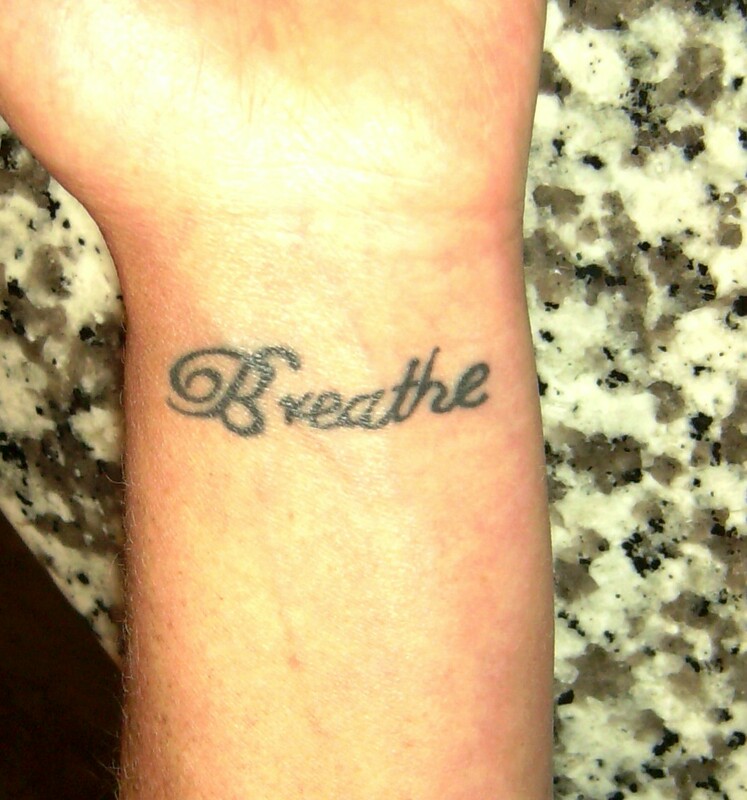 A tattoo can become a wonderful teacher when it comes to remembering something of a great importance. 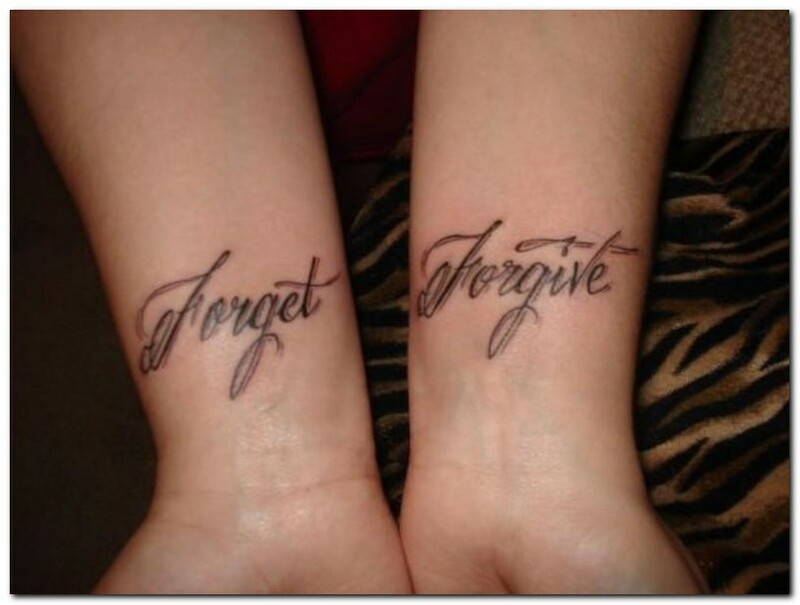 These words on the forearms of the person “Forget ” and “Forgive” are an excellent reminder that there is no need to remember something bad that was done to you as it is a total waste of energy. Try to forgive a person for the wrong doings and forget about this. It will make your life much easier. 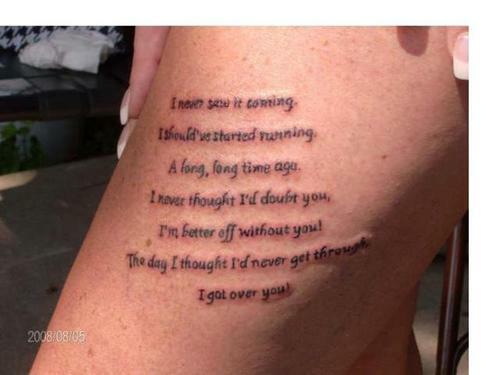 The text that you can see on the hand of the person is the lyrics of the third single by Chris Daughtry that was entitled “Over You”. It was an award winning song that managed to receive BMI Award in 2009. As per interview with an author, the song advises us not to get discouraged, if we lose our love. Once the time has come we can find a new one that will be even better and stronger. 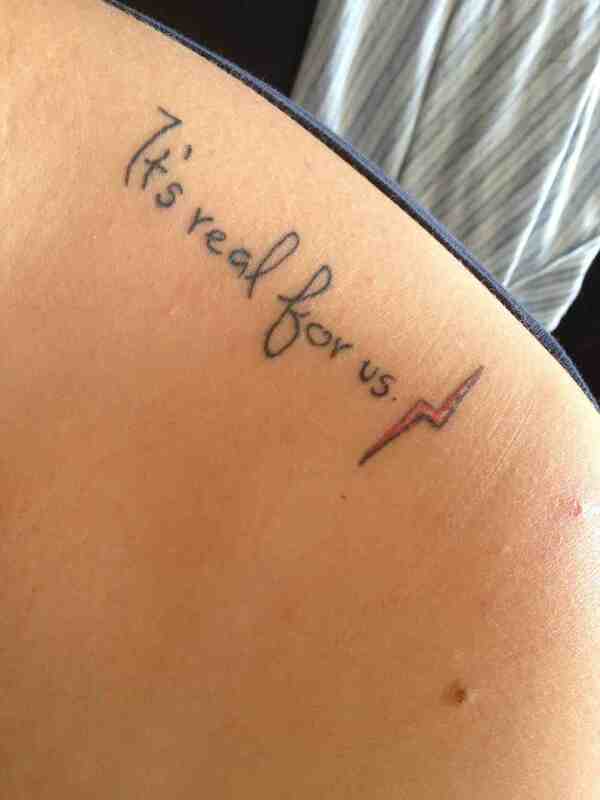 This is a tattoo that was probably inspired by the song of a famous band Depeche Mode. It shows us that the world is filled with noise and meddling. Sometimes the best way to bring your thoughts to order is to sit in a quiet place together with your inner self and try to understand the world around better. In this aspect silence is your best friend that can assist you in your spiritual searches. 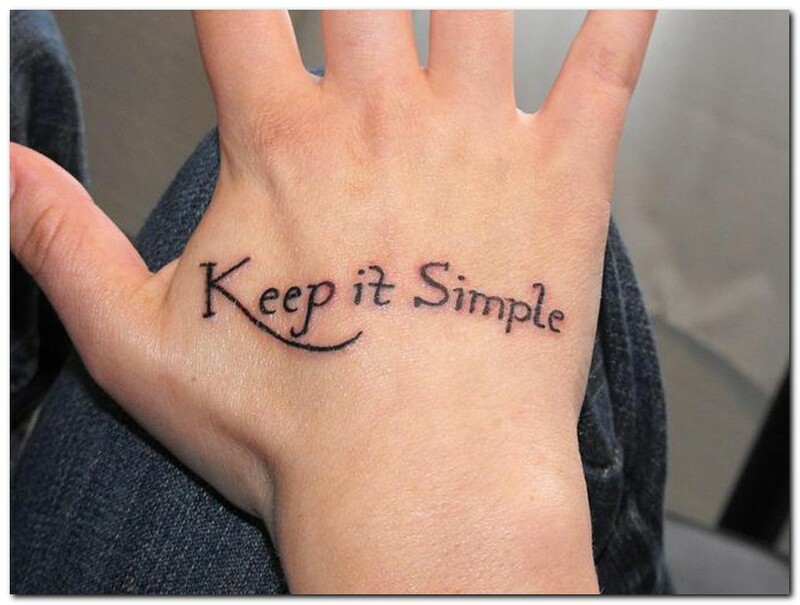 What can be special in this simple tattoo? It is composed with a single word and one might think that there is not much to tell. 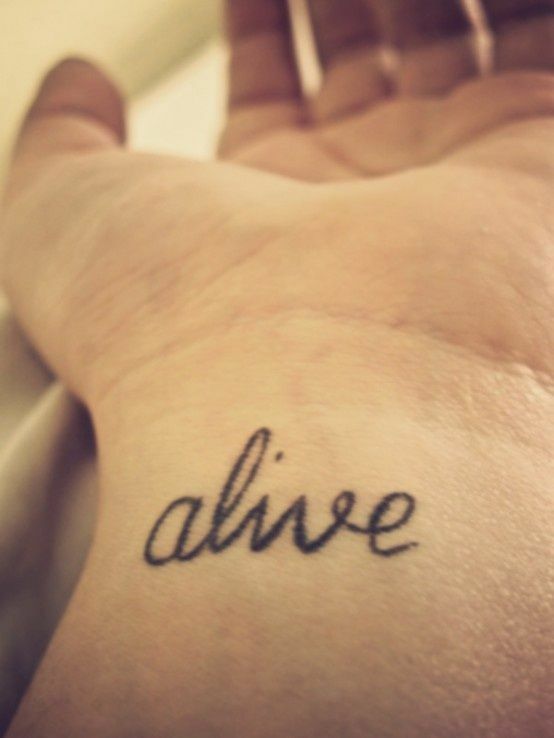 However, it would be better to say that this tattoo is a wonderful teacher that can teach us the most important thing – when you are alive, it means that everything is possible. You need to put all the efforts in order to achieve your goal while you are still capable. This is a quotation of Antoine de Saint-Exupéry from his world famous story “The Little Prince”. It shows that it is very important to be able to release your emotions. It can be translated as “He lied on the grass and started crying”. The little prince became overwhelmed with sadness and just couldn’t control his emotions and burst into tears. The Flower told him that it’s natural to cry and one should not be shy of it. This is a phrase from the refrain of the song by Peter Gabriel “In your Eyes”. As per the author of the song he sings about love. This is love not only between a man and a woman, but also between a person and God. The very phrase means that if you are totally naked there is someone to love you and stay nearby, offering support and a friendly shoulder. 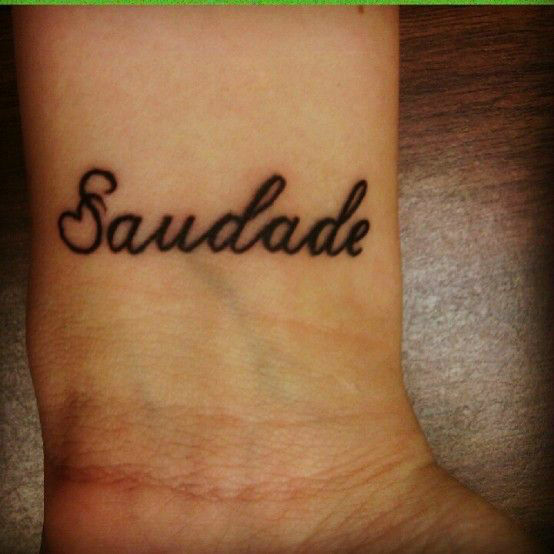 The word “saudade” is not just another word. This is a special state of soul that is used by Portuguese and Brazilian people which describes a state of deep nostalgia of someone with whom the person is deeply affected with. It can be compared with a strong longing to see the person or experience the feeling of love and passion that were for some reason lost. In other words it is the remnant of the lost love that keeps the heart warm. 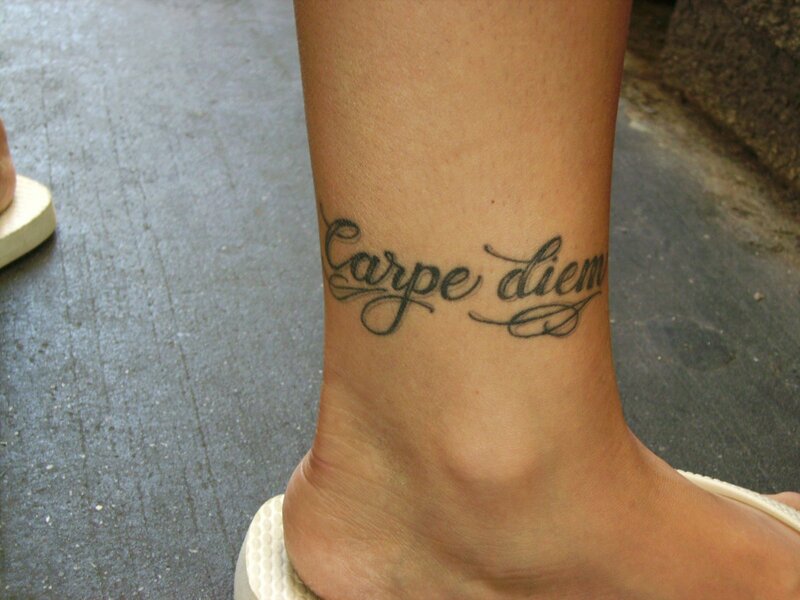 It’s time for Latin quotations in our list of word tattoos and it is better to start with one of the most popular ones: “Carpe Diem”. It literally means grasp the Momentum. The phrase orders us to live within the moment of now without wasting your time upon the thoughts about past and worries about the future. The most important thing is living here and trying to live in the best possible manner. 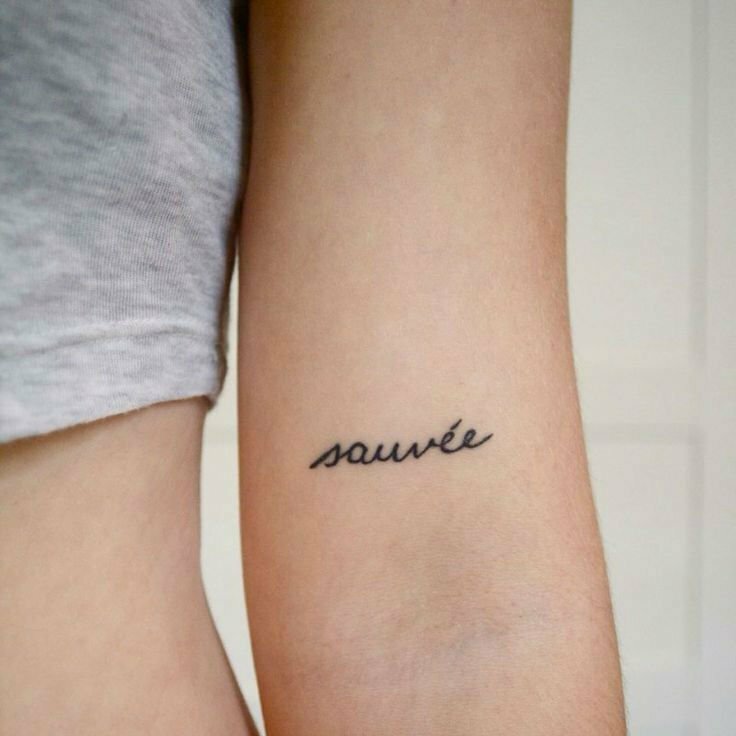 Here we’ve got a French word “sauvee” that is depicted on the person’s forearm in a fine black cursive writing. It means “saving”. 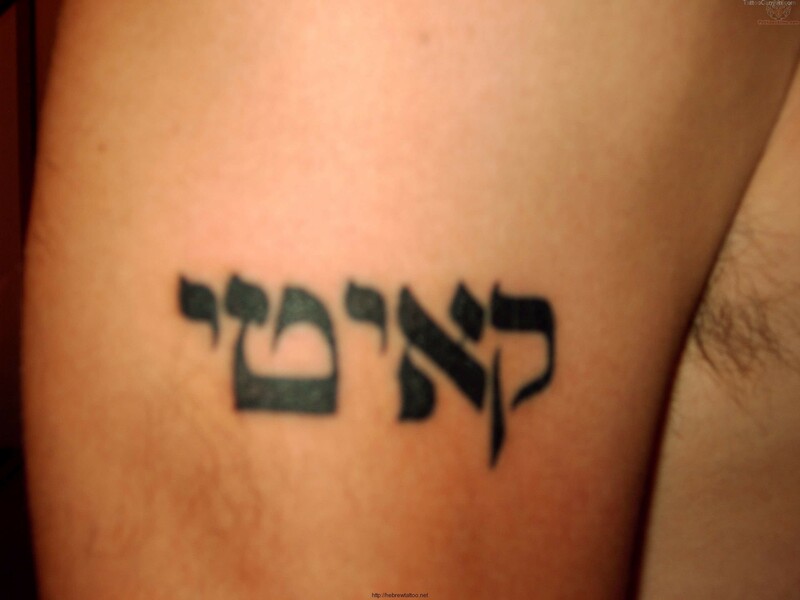 This tattoo can be a soul’s scream for saving by some divine entity like God or angel protector. It’s something like a talisman which will calm down the person in the most difficult moment and bring the feeling of security whenever something happens. Love can come in various shapes and forms and it can bring the widest range of emotions. Love is the feeling that has been described by so many poets in their verses. It was made so that a person would never forget that love is one of the most fantastic things in the world and that people should cherish it and grant respect while it is still possible. Love can make wonderful magic and bring renovation and peace to the whole world. The only thing one needs to do is to accept it. #13 For the Sake of Creation! You live when you create something! That is one of the ultimate truths that was stated by the philosophers of all times. The ability to create something is placed into our body by the demiurge himself and many people often neglect this capability. The ability to create something can be seen not only in something unusual, but also in totally common things like baking, sewing, doing some housework etc. That is why each person has a potential of the creator and shouldn’t forget about this. 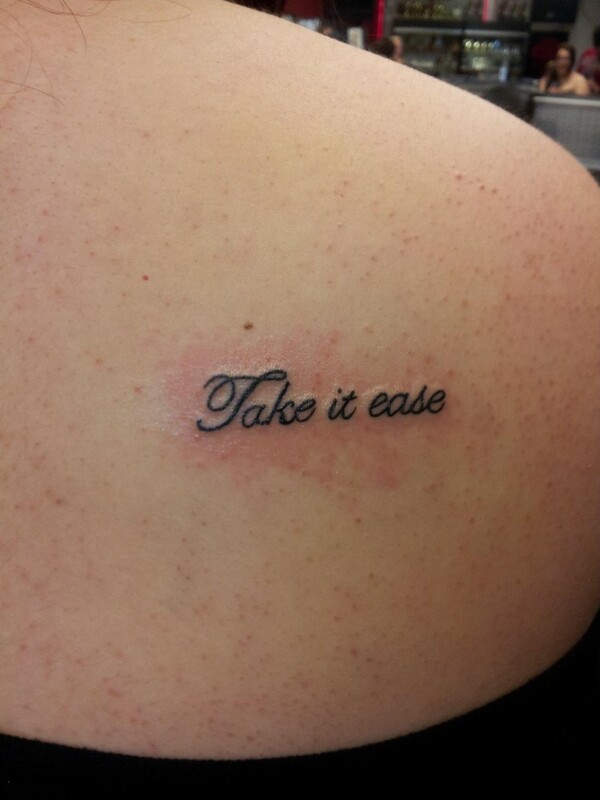 Here we’ve got another tattoo that was inspired by a song. This time it was a song that was created by The Gazette with the name “Filth in the Beauty” that immediately became a maxi single. 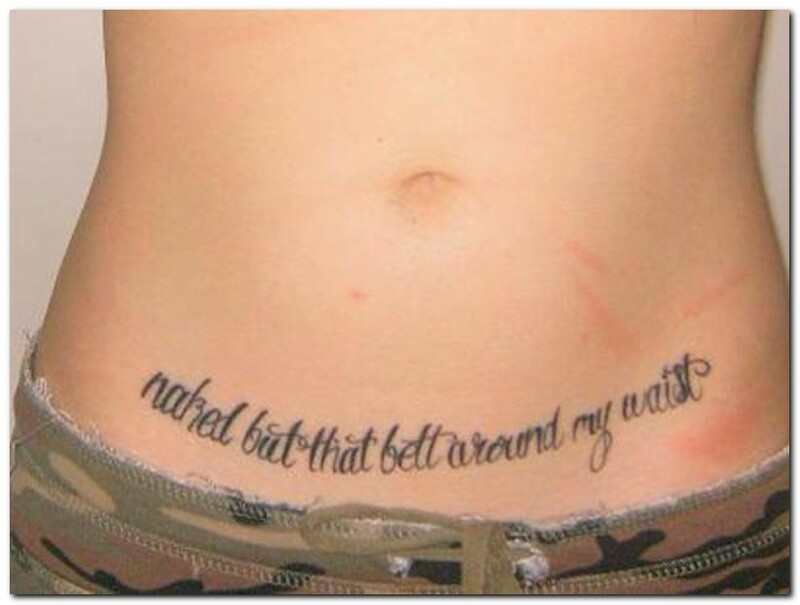 Such a tattoo can be accepted as a tribute to the creator of the song or as a wise quotation that means that beautiful is not always good and positive. A lot of filth can hide beneath the mask of beauty, pretending to be such. 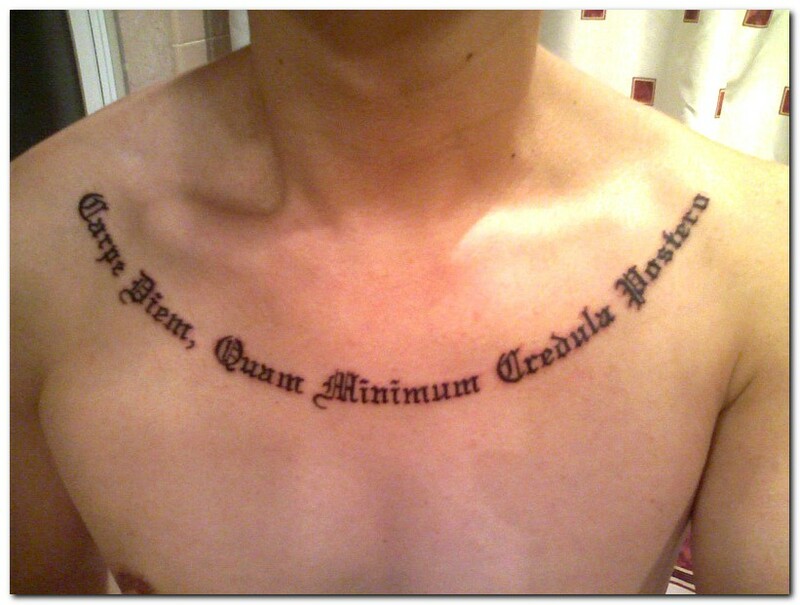 This tattoo with a Latin quotation can become a great life teacher as many tattoos do for people. It carries an important message from the ancient Roman drama writer Horatius. By this simple phrase the author tries to stimulate us to enjoy the moment of here and now and never believe in future predictions as they might turn out to be either false or unlikely to come true. Only the moment of present is of a primary importance, everything else is secondary. 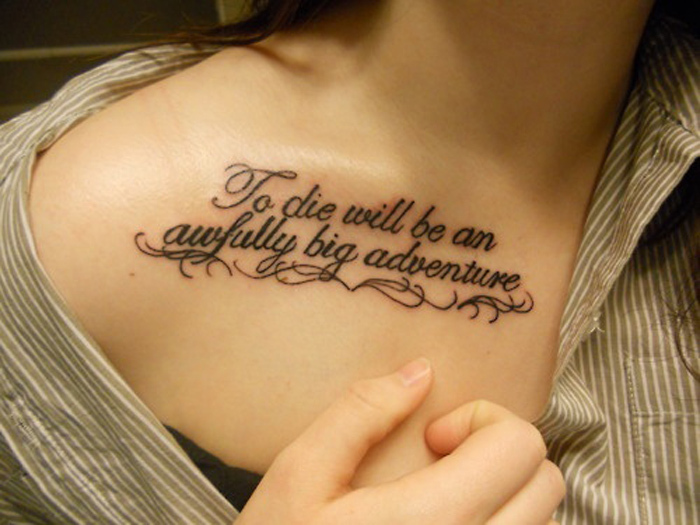 The phrase on the body art belongs to a popular fictional character Peter Pan. During the Act three of the play the eternal boy understands that he is really afraid of death but later on he accepts it with a one single phrase “To die will be an awfully big adventure”. Perhaps that means that death is still not the end, it is just a continuation of a story. In fact, there are many quotations from Harry Potter books that are worth mentioning. For example, here we’ve got a fine quotation from the dialogue between Lily and Severus Snape, while they weren’t wizards yet. It was the phrase that was said by Snape regarding the magical world that existed around them in a total invisibility. He promised that everything that seemed a fantasy will become a reality for both of them. 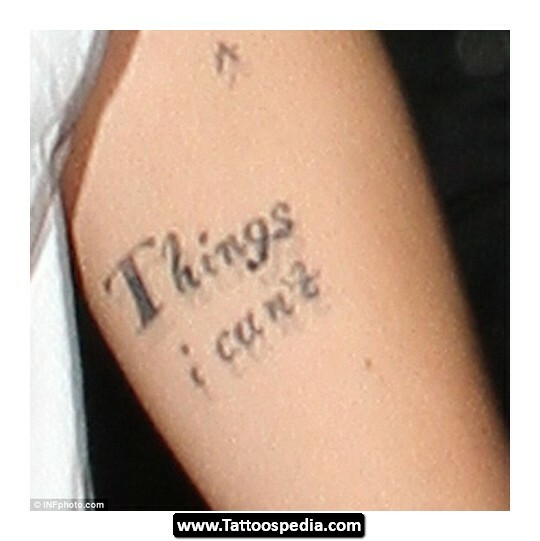 Someone might think what can be motivational in a phrase: “Things I can’t”. If you look further after these words there is a blank space that can be interpreted with a single phrase “there is nothing that I can’t do”. It shows us that a person is capable of anything and has a limitless potential of achieving goals under any circumstances, ready to overcome difficulties of any type. 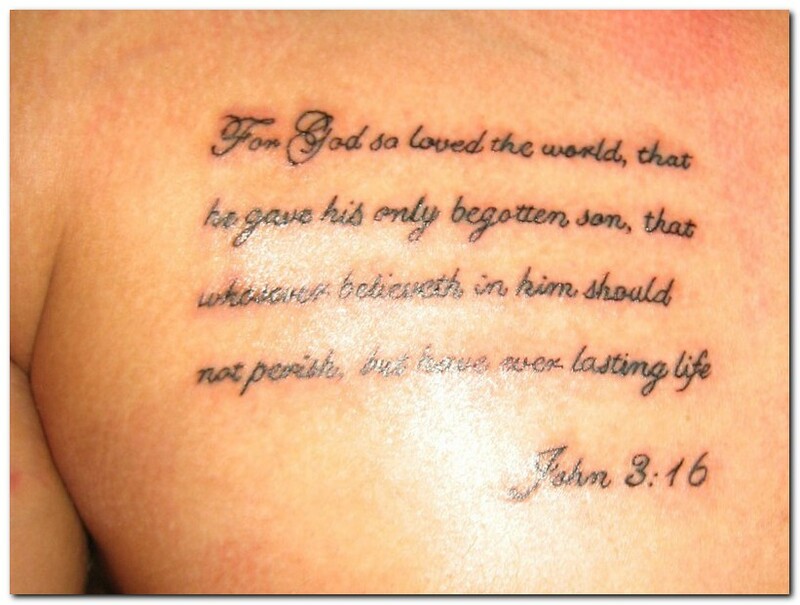 This is an extract from John 3:16 verse that can be considered a fundamental pillar of the whole Christianity. This is an engraving of the idea that Celestial Father has sacrificed his one and only son in order to bring redemption for people’s sins and grant them eternal life after death. This is supposed to be an excellent preventive measure against sin as people should remember what sacrifice has been done for their sake. There is nothing more pleasant than a reminder of some important event. It may be done on the body of the person. This might be an example of the birthday of a precious person like a child, a wife, a mother etc. It looks awesomely stylish and attractive. Moreover, it will be pleasant for a person for whom it has been done to see it imprinted on a skin. 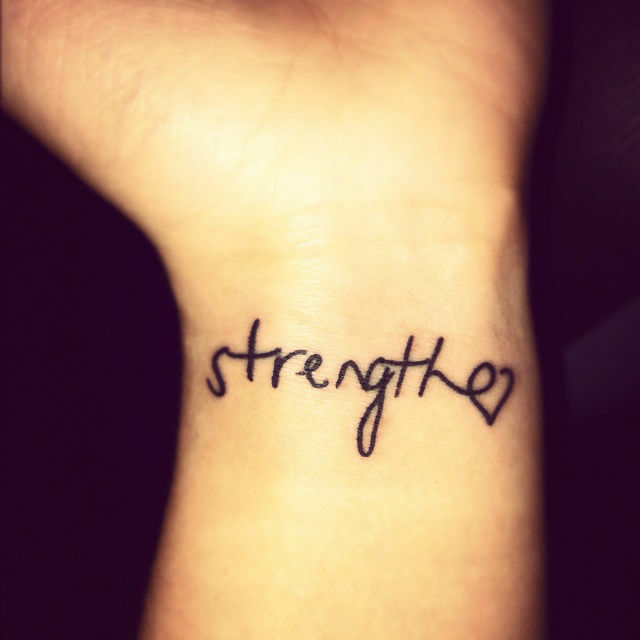 The tattoo reflects a really strong emotion towards a person with whom you’ve got a strong bond. 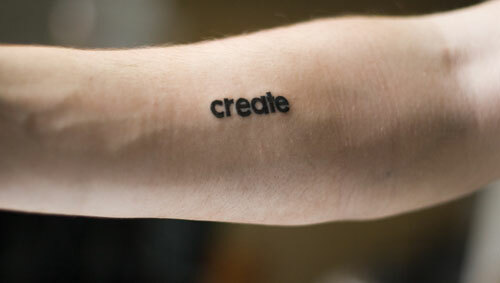 The canvas of a person’s skin can be used for writing down all important events that have taken place in the life of the wearer of such tattoos. With the flow of time the person will place the vital events on the skin so that a user could remember the most memorable moments in his or her life. The best thing about such designs is that each date can be designed in a totally different style, color and font to see the difference in the list. The back is the best place for writing down the information as it has got the greatest amount of space. One word can change entire lives of nations and people. The only word “IF” changed the fate of the whole nation of Laconia, when the Spartans invaded their territory. Here we see a simple word “Strength”. 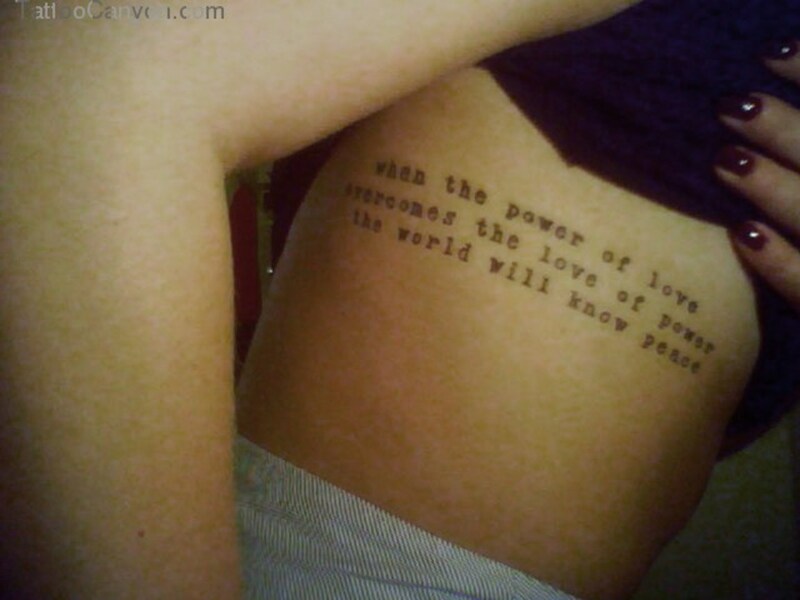 It is obvious from the sense of the world that tattoo reflects the desire of the owner of might and power. It’s obvious that it is not only physical strength, but also any sort of moral and spiritual might that is necessary for dealing with problems. Very often people prefer writing the words which carry the ultimate importance for them. 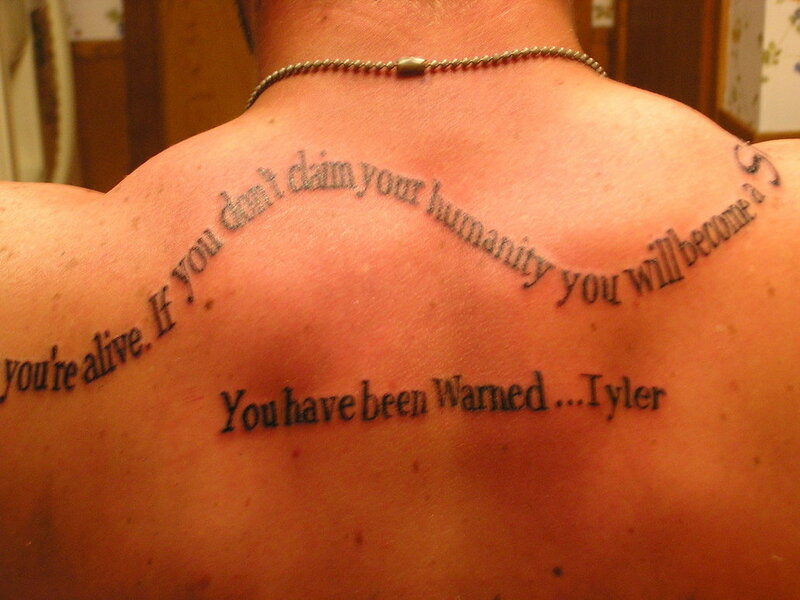 In this case we’ve got the word “loyalty” that was scribed on the back of a person in a fancy eye style design. Loyalty is not only an state between people in love, but also between friends, partners, spiritual mates etc. It can be interpreted in a way that you are loyal to the surrounding people and demand the same thing in return. Sometimes when everything around seems too difficult to comprehend and the life situations seem unsolvable, there is a very simple mean to make things right without wasting too much energy and efforts. You just need to relax and let it go. Keeping it simple is often the best way out of any situation as during facing difficulties people tend to complicate everything. The charismatic alter ego of the protagonist from the “Fighting club” – Tyler Durden said this unforgettable phrase to himself. It states that sitting on a single spot and doing the same thing day by day is a useless thing that transforms a person into the amount of numbers, a statistics that will be of no worth for everyone. The person should rise and fight in order to obtain the state of human. The fighting is an allegory to the ability to setting and achieving goals. 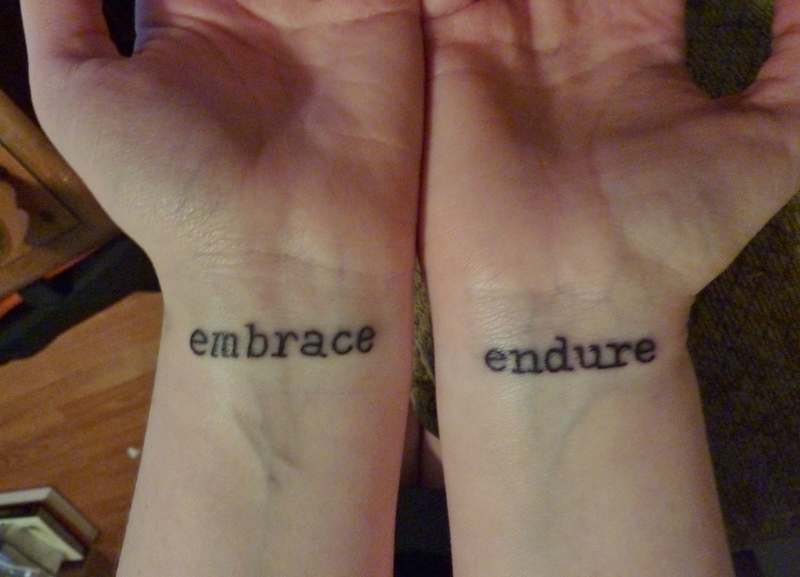 The word that is engraved on the wrist has multiple meanings. One of them is returning back from the kingdom of death. However, there is a totally different meaning of such a word. 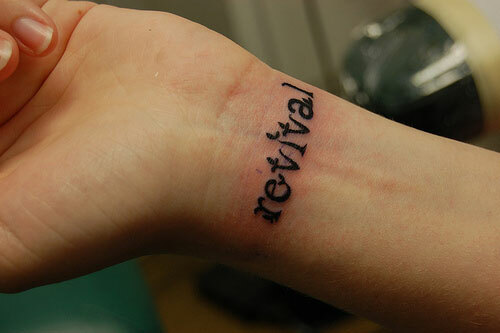 The “revival” can mean a spiritual transformation, when you gain a totally different experience. Revival is an opportunity to start everything from the beginning. It’s the ability of every person to have a restart and try to live a totally different life. Jimi Hendrix was definitely a talented artist, but, in addition, he was also a wise man. Most of his songs were about love, but he managed to put a deep sense into the lyrics. This quote is among the wisest ones. He states if people understand the power of love and forget about love for power, they will obtain real peace. Many people will agree that love is a total opposite of violence so when love wins, there is no need for violence in the world. 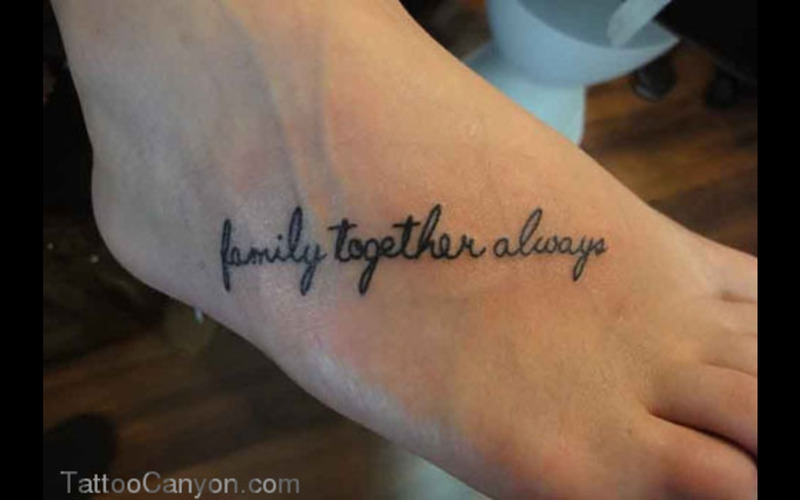 This is a phrase that explains the importance of the family and the necessity to stay always together. Family is always somebody who will be near you, offer a support and aid at the time of need. One needs constantly to remember this, but sometimes the person forgets about it and needs a reminder. A simple text saying that the family needs to be always together is a good memento that will remind of the importance of the closest people. 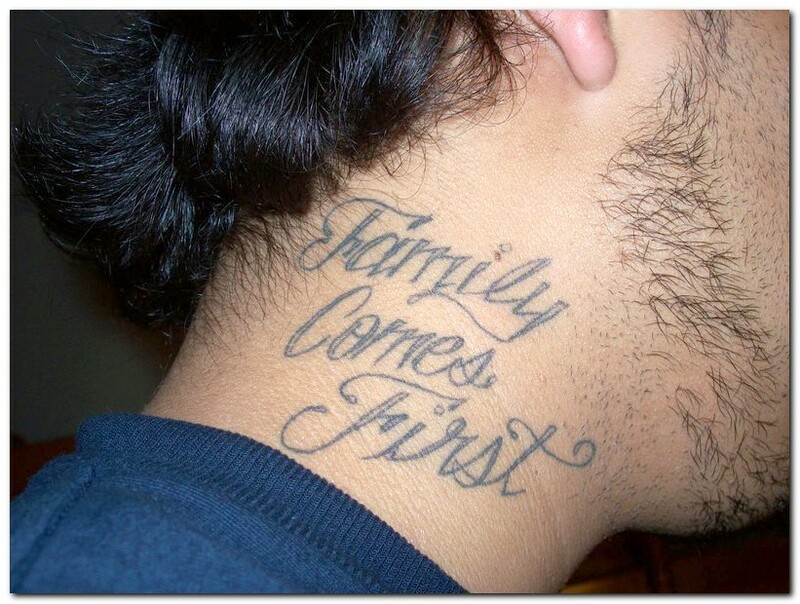 This tattoo is made in a design of some Mafiosi script. The phrase is very close to the idea that was reflected in Mario Puzzo’s “Godfather”. As it was often said by Don Vito Corleone the family is something that needs to be always taken care of. Your relatives should be the top priority when making decisions as they are the people who are perpetually near you and know you the best. You need to be grateful to them for they accept you the way you are. There is a popular trend in fashion to create a tattoo on the back of the owner at the place where the wings of an angel are supposed to be. This tattoo is considered a defense charm against evil as our angel protector will see the text on the back and will do what he is asked for. 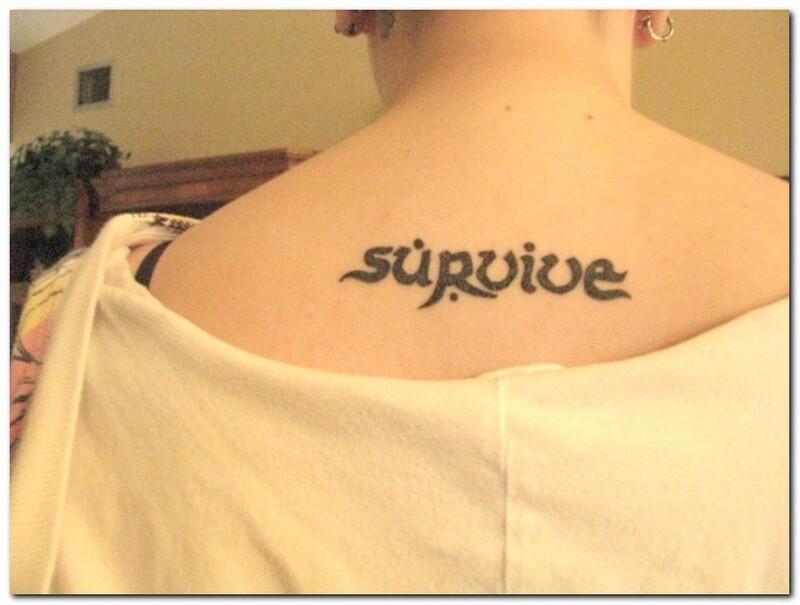 In this case we’ve got an art that asks the person to survive under any circumstances. Whenever something happens the preservation of one’s life is a top priority. 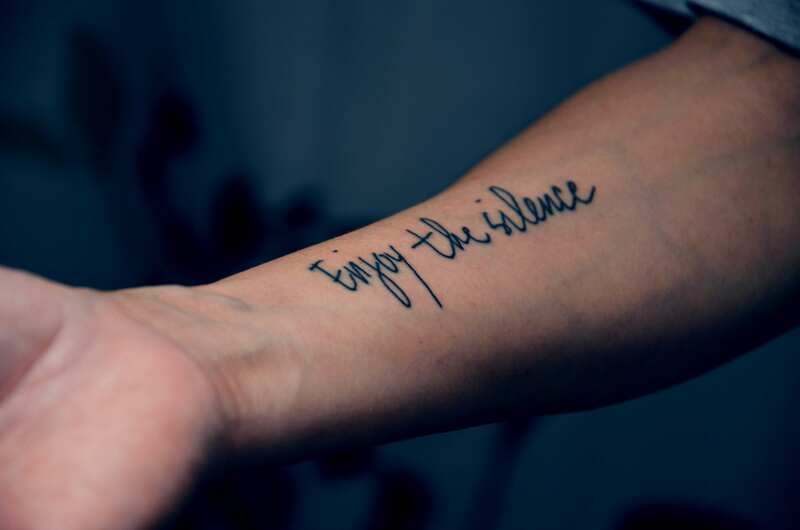 This elegant tattoo that was performed in a fine handwritten font teaches people not to miss an opportunity during the life. All of us should memorize a simple truth that we live just once and every action that is undertaken carries an equal important significance for future. 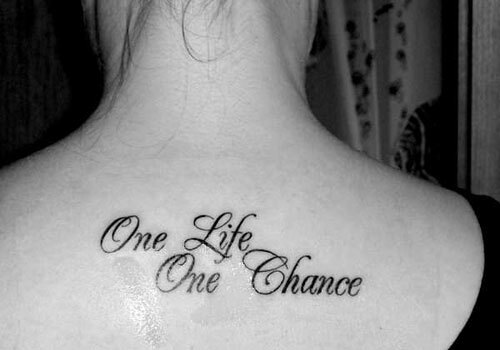 The chance of life is the most valuable treasure that should be used with wisdom. Every step should be performed with extreme care and with understanding of the possible consequences. Lust is a feeling of strong affection for something. Here is a description of one of the strongest desires that is characteristic for a human being – the lust for life. This is the most fundamental instinct that is characteristic not only for a person, but for animals as well. It illustrates the fact that if someone enjoys the life at the fullest, it means that the person is really happy. Tension is not necessary when doing anything. A strong tension is something that prevents people from doing something correctly as it causes stiffness not only in body, but also in mind and spirit, blocking the generation of new ideas. The ability of the person to relax and let something go means seeing beyond the scope of understanding and find a way out easier, faster and more effectively. 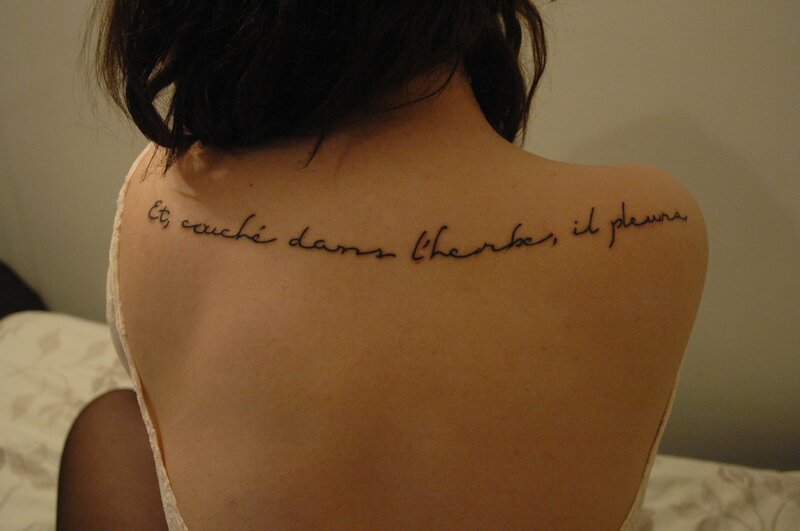 This tattoo that is really hard to read is from Twi language that can be translated as “We will meet again”. In this simple phrase there is a very deep sense that is far more than just seeing each other once again. It means not just a physical return of the person, but also the retrieval of some emotion one more time. This phrase goes far beyond the scope of physical plane, it is more related to the spiritual and emotional planes. 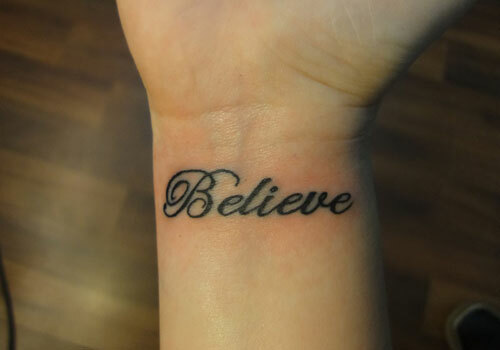 The tradition of putting a tattoo on the wrist has become extremely popular among people, ladies in particular. It is very convenient to put a memo tattoo at this pot as we tend to look very often at our hands and sometimes even in a pitch black darkness we can see the image of our hands. 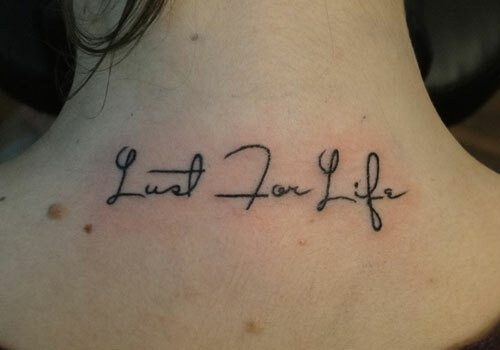 This tattoo is a reminder that we should experience every moment of life to the fullest. Back in 1845 a famous abolitionist wrote this phrase in the memoires about his life of a slave. He wished to carry us an important idea that fighting is the means of progress and if we put all our efforts to achieve some goals it will become possible. He set a goal to become a powerful anti-slavery leader and he managed to do this and did a lot of things to assist black people to occupy some posts in the government. The text of the Corinthians 15:32 says this bold phrase through the lips of one of the soldiers. The person states that every day he faces death and every day seems closer to Lord Jesus. He tells that one should live every second to the fullest as nobody knows when the moment of death may come. This phrase was said by a famous Danish poet Hans Christian Andersen. It won’t be a lie if we say that all people in the world speak various languages, while there is only one language that can bring multiple nations and various people to mutual understanding. Music does not require words, the melody tells us everything so that more people could understand everything. This tattoo offers a very simple foot solution of body art. 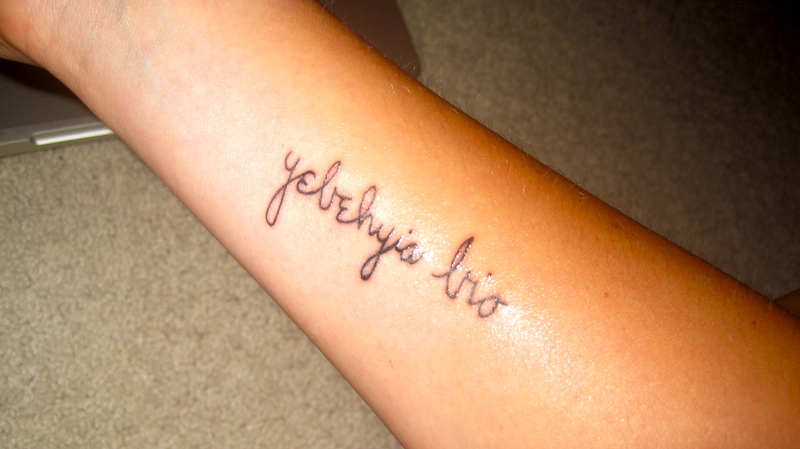 It has got a single word that is written in a stylish feminine font and a stylized cross at the end. The word “holy” is the reflection of a strong belief that should be present in the souls of all people. Here were can see the words naming actions that would be greatly praised by a person with a strong character. The skill to embrace one’s dreams is the most powerful action that is necessary for setting one’s goal. “Endure” is the action that is necessary to undertake in order to face all the difficulties that will stand on the way to accepting the fate and goal of the person. When combined this two simple actions will transform into a powerful weapon of acquiring an ultimate happiness. There is a famous illusionist who used to perform in Las Vegas. He is currently involved into charity for children ill with cancer. He performed his shows under the motto “Believe!”. He wished to prove that everything is possible in our lives and there is an important thing that must be done while planning something – it’s strong belief that everything will end up well! Another stylish writing of an important word in the life of any person shows us in a symbolical manner that if you believe in something, you will be able to grasp the star from the sky. You know that the heroes of the fairy tales believe in something miraculous and it happens for real. 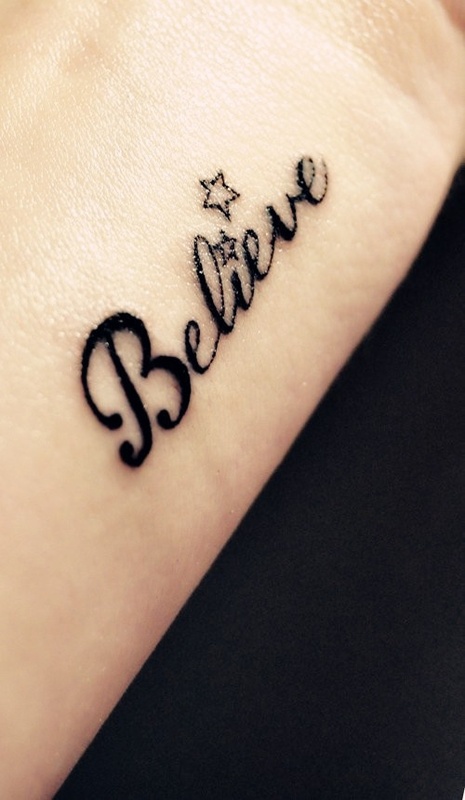 You should also believe in miracles and this body art will remind you about this. The goal of the person is to create something as it was said in the Bible – God created the person to be similar to him and as the God was the creator of everything, He granted the potential of creativity to the person and one should be wise enough to spend the time creating something. Despair is considered one of the strongest negative emotions among all and the person requires something to deal with it. The weapon against despair is a strong belief in something good. If you believe that everything will be good – everything will be good! One should never abandon hope as it is the greatest source of motivation for any person. 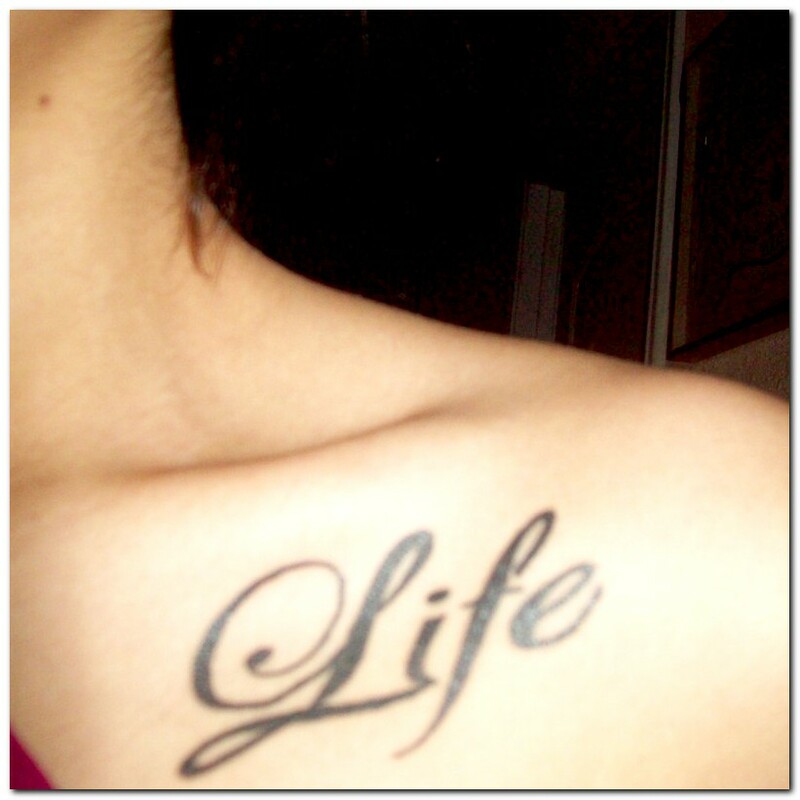 Another popular fashion for shoulder tattoos is the tattoo with a zodiac sign. 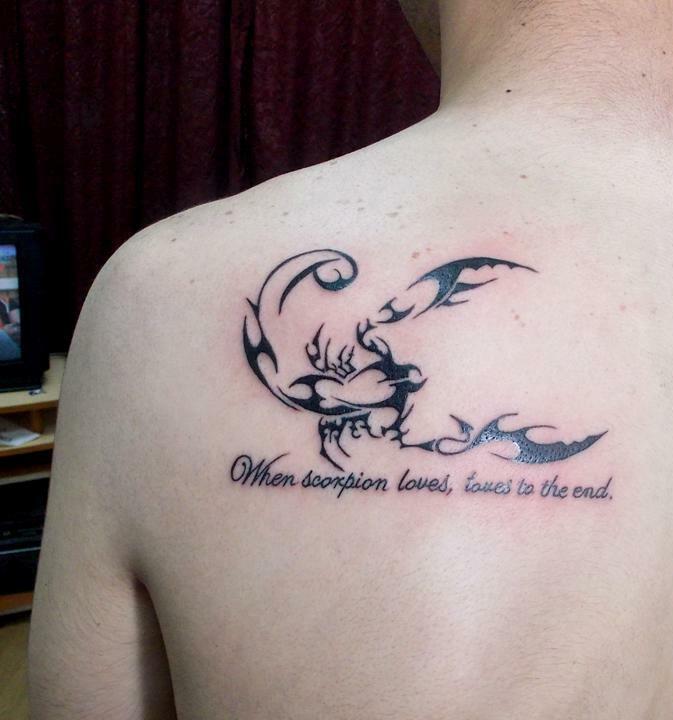 Here we have got a stylish tribal style scorpion with a signature that describes one of the qualities that is characteristic of the star sign. 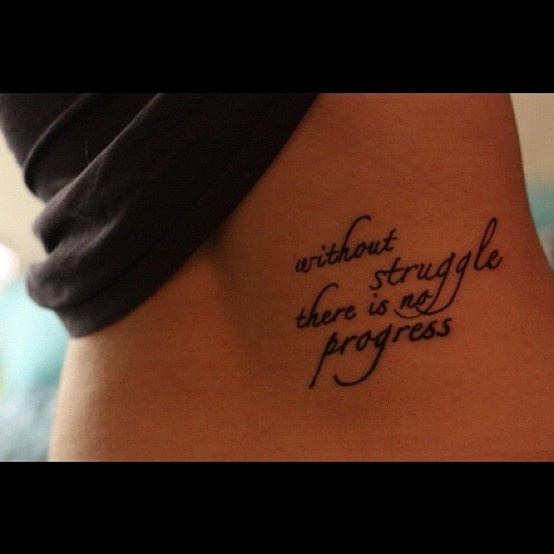 One can check out the Internet to find the most suitable phrase and design of the tattoo. 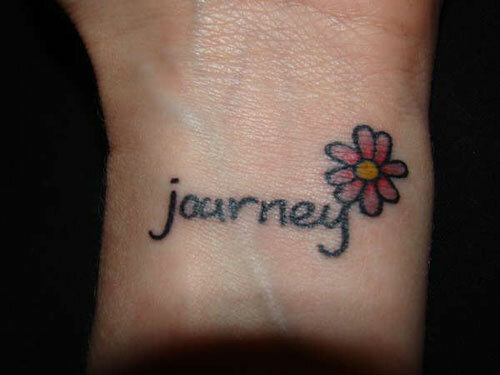 This cute tattoo would be a very characteristic one for a girl who wants her first body art. The flower at the end of the word is a rather girlish attribute. The journey can be as a simple writing or as a reflection of an inner desire of the owner to set off on some sort of a journey. For a teenager a journey and new experience are the most important factors for personality formation. 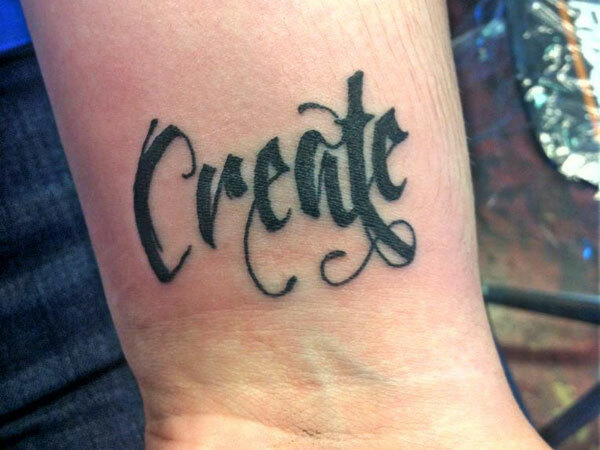 The Gothic fonts are awesome inspirational tool for creating a tattoo. 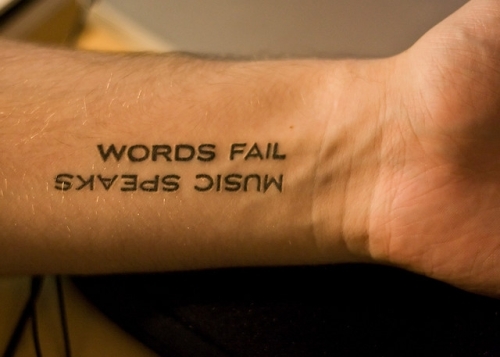 There is some peculiar fleur of medieval times when you print this tattoo on the wrist. 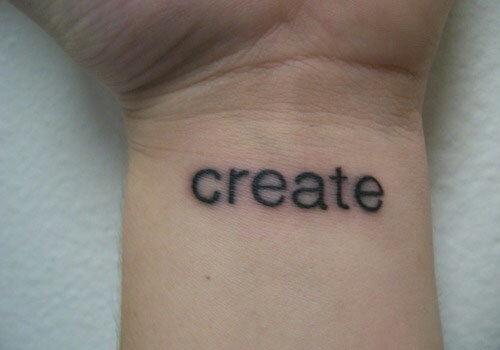 The word “create” is an awesome inspirational memento for a creative person. This would be an excellent tool against procrastination as every time the person would like to avoid the responsibility the word on the wrist will order to create! It is very often said that people find their reflection in the eyes of their children. The Scottish poet Thomas Campbell stated that we are immortal, but our lives find continuation in the hearts of all the people who’s got the memories of us in the hearts of ours. So having the kids means living forever as they will be your continuation. 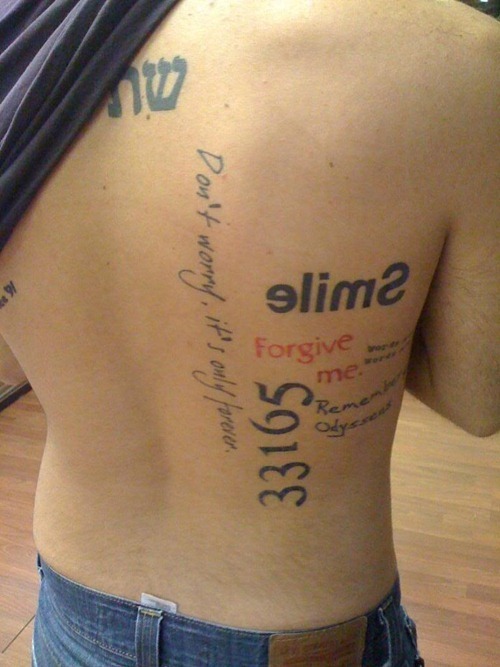 The extracts from some popular poems are also an inspiration for a body art. 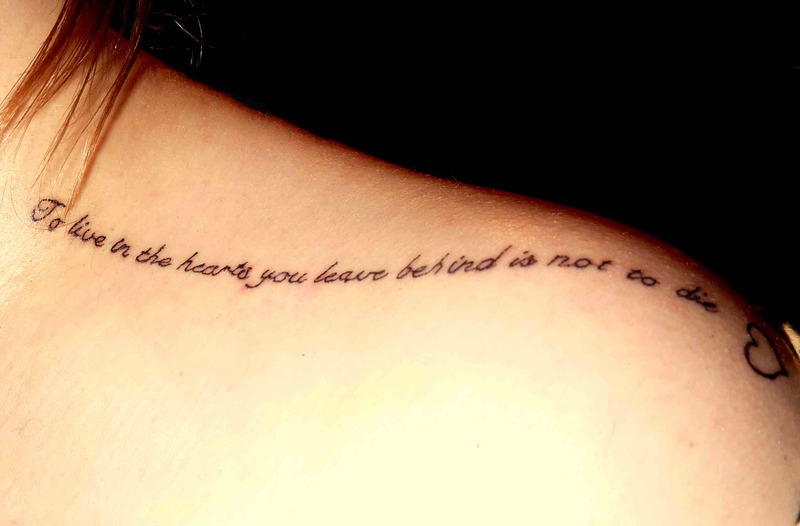 Here we can see the phrase from the poem by Ray Bradbury. It tells us about the eternal searches of a human soul for a best place to live and about the beauty of the motherland where the roots of any person are. It will be a wise phrase to say that peace is one of the most important things for the modern society as this seemingly simple word prevents hundreds of deaths in the wordl and brings happiness and calmeness. 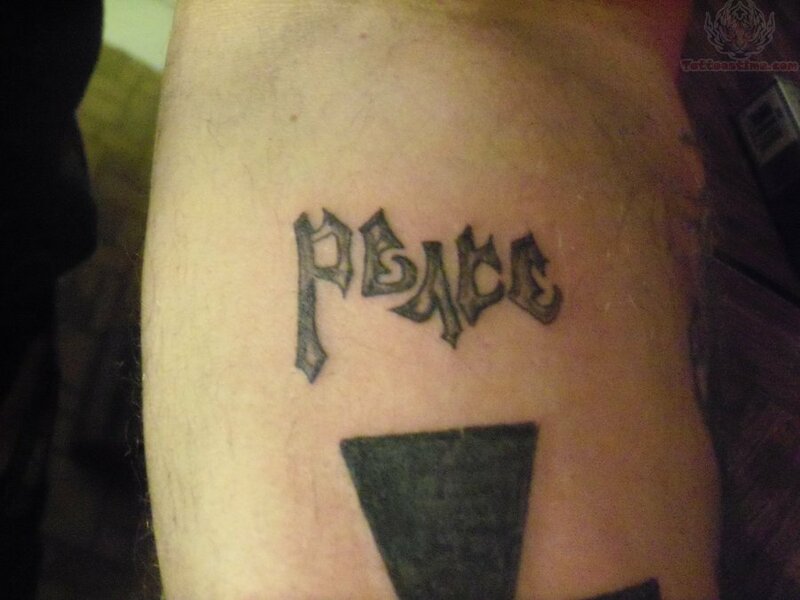 The tattto on the shoulder reminds us that it’s very important for every single person to maintain peace in the world.